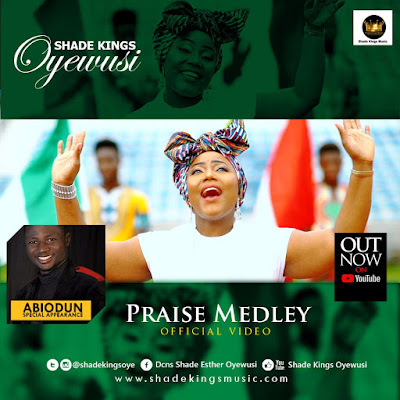 International worship leader, singer and recording artist, Shade Kings Oyewusi premieres her debut music video for her single “Praise Medley” off her MIRACLE WORKER album. “Praise Medley” was produced by Adewole Adesanya (Mr. Wols) and the official music video directed by Yinka Davids. Be blessed as you watch the visuals. Are we ready to give the Lord some quality praise in this place ha! Ogozi ri ma gozi , O tin yere jara (in blessings He has blessed me, and added more blessings to me). Shade Kings Oyewusi is a Canadian-Nigerian worship leader, singer, songwriter, and recording artist. She is set to bless the world with her music ministry. She is also an Educator and lover of little children. She has been singing since she was 8 years old. Shade Kings was a leader of NIFES Choir back in the university days in Sokoto. She also started the choir in RCCG Kuwait and RCCG Lighthouse Canada. She has graced the stage with Daddy GO during Canada Saskatoon Rally, also with Ron Kenoly of the United States. Shade Kings is happily married to Minister Niyi Oyewusi and currently resides in Canada with her family. Above all, the name of Jesus alone is to be glorified through worship and praise.